Innovative PR10 collaborative gripper needs no external air supply and can be installed in less than 30 minutes; dual gripper can cut production time up to 50%. Known for its safe interaction with humans, the dual-arm collaborative industrial robot is new technology that is used in industrial manufacturing settings. Pioneered by COPAN, this is the first time this technology is applied to Clinical Microbiology. VadaTech, a leading manufacturer of integrated systems, embedded boards, enabling software and application-ready platforms, announces the AMC640 and AMC641. The AMC640 is an M.2 Host Bus Adapter (HBA) which supports up to four M.2 type 2280 and /or 22110 style storage devices. FANUC is the global leader in automation for manufacturing. 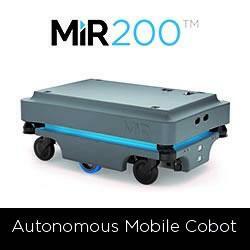 Their innovative robotic solutions are world renowned and offer superior performance. TE Connectivity honored Mouser Electronics with the 2017 Global High Service Distributor of the Year and the 2017 Customer Expansion Awards for Americas and EMEA regions. Nearly 70 percent of employees believe that robotics and automation offer the opportunity to qualify for higher skilled work. This is the result of a worldwide automatica survey of 7,000 employees in seven countries. 05/29/18, 12:35 PM | Industrial Robotics, Factory Automation | IDS Imaging Development Systems Inc.
Only three years after the production of the 500,000th camera, the company delivers the millionth IDS camera in the second quarter of 2018. 05/28/18, 05:42 AM | Industrial Robotics, Factory Automation | Electromate Inc. The EDD-3701x is a motor amplifier that operates in an EtherCAT distributed system where there are up to 32 slave drives and one master. It has a daisy chain topology using standard CAT5 Ethernet cables.